About 42% of visitors to your website will be using mobile devices. 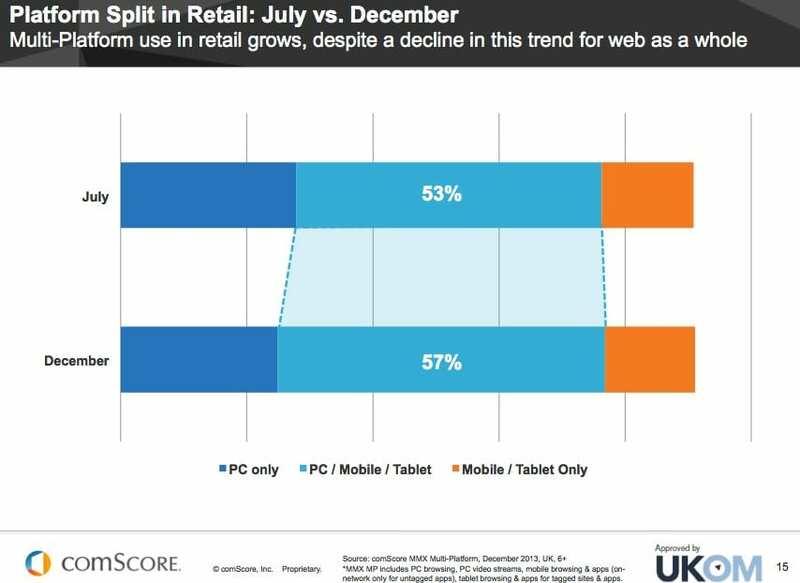 A growing proportion of users (currently around 15%) don’t even have laptops or desktops to fall back to. The immediate danger to organisations, therefore, is that their site may not be suitable for this large proportion of users. If there is too much effort involved in using your site – for example if elements are too fiddly to tap, or pages require a lot of panning and zooming to read, then this proportion of your audience will leave you for someone else. Unfortunately, most websites developed over 24 months ago, and even some more modern ones, do not properly cater for mobile users. Look at each page on your website with your smartphone, and if all you see is a tiny copy of the same page you see on your laptop/desktop, then there are significant improvements which can be made. A site which requires constant pinch zooming and panning is too much effort to work with, and won’t keep its visitors. A responsive site is one which smartly rearranges itself to fit the device it’s being viewed on. For example, it will display text in three columns on a laptop, two on a tablet and one on a phone. On small touch-driven devices it will ensure that buttons and links are large enough to hit accurately with a finger. And the navigation will be laid out to fit the device. Note how the navigation is moved into a pull-down menu on the top right, to prevent it from being too small to tap. The text has been moved into one thin column so it fits naturally on a phone screen. And importantly, notice how nothing has been removed – every piece of information, option and functionality remains. (This compares to the old fashioned “mobile” sites, which were just a cut-down version of the main site, and generally had people reaching for the “view full site” button). So a responsive site is a bare minimum for practically any organisation. If you don’t already have one, then creating one will provide more visitors, whose better experience means they will stay for longer. It is a great, and relatively simple, way to improve business. However a website, even a well crafted responsive one, still suffers many problems common to all websites. For example, perhaps obviously, no website is of any use when your internet connection is poor – a situation common to most mobile users on the move. And a website can only provide generic information: it knows very little about its visitors, so its messaging is necessarily generic rather than highly-targeted. These problems can be solved with a dedicated app… the subject of next week’s blog! Which platforms should I target: iOS, Android, …? Android, iOS, Windows Phone… what makes most commercial sense, and which audience is best for my app? We are often asked this question at Apps In The Sky. Time was it had an easy answer. You released an app for Apple iOS first and others later if at all. Apple had the most users, the largest app store and – arguably – the best system. Then Android upset that. Since about 2009 its rise has been meteoric and now it has the most users by far – 7 times as many as iOS, which is the next largest. So surely the question once again has an easy answer? Well… no. As with all questions of marketing it depends on your audience, and Android and iOS users are very different. iOS users pay more. Possibly due to the expense of developing and publishing to the Apple App Store, and possibly due to the fact that it’s smaller altogether, it has much fewer free titles available than Android. Generally therefore Apple users are more resigned to paying for extra functionality. Android users are a much wider base. The sheer range of devices available, from entry-level to top end, make it almost universally suitable. It is used by all kinds of people from CEOs to your gran. iOS users are generally more tech-savvy. All of Apple’s products are at the most expensive end of their markets, and generally the people who spend more on phones/tablets are the people who know more about them. There are other differences too, and the market split is quite interesting. We have published a whitepaper with more information. But if you want our quick answer: wait, and release both together. Usually our customers have invested significant marketing resource in that first big “splash”, and just makes sense that your message can apply to your whole audience. To read more, see our whitepaper: Which Platform?